Dynamic DJ Service only invests in top of the line professional DJ equipment with names like Traktor, Mackie, Shure, American DJ, Numark, Apple and K&M. Our system is truly superior and serviced regularly. Lighting and microphone use is always included in every package. Don't assume all DJ's all use the same equipment. We have invested in the best systems available. Although our system is of superior quality, it is quite compact. Everything will be contained on the DJ table except for 2 stands which will contain the speakers and lighting. Most of our DJ's use the above DJ controller providing quality performance! 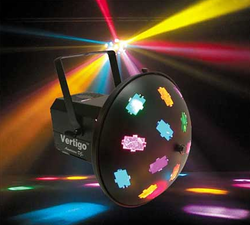 Lighting, similar to these two shown are included every time you hire one of our DJ's. The photo of the speakers are of quality speakers we use. These are Mackie SRM 450's. There is also a video below with technical specs if you are interested. Dynamic DJ Service only invests in top of the line Professional DJ equipment with names like Mackie, Shure, Numark and K&M. Our systems are truly superior and upgraded regularly. Don't assume all DJ equipment is the same. Yes. Every package includes basic lighting. Do you provide a microphone for speeches? Yes. You may use our microphone for speeches at no extra charge as long as it's within a reasonable distance from the DJ table. As much as you want us to be. We interact with your guests, attempt to keep things flowing and inject some fun. We like to help break the ice and incorporate fun party games, if appropriate to you. Check out these videos of our lights and speakers if you are interested in more information about them.